US adults spent 72.5 billion minutes consuming news in the average week in 2016, an 18% increase from the prior year, according to Nielsen. The research firm found that the biggest increase came from national cable news networks, with weekly gross minutes of news consumption reaching 27.1 billion last year, compared to 18.8 billion in 2015. 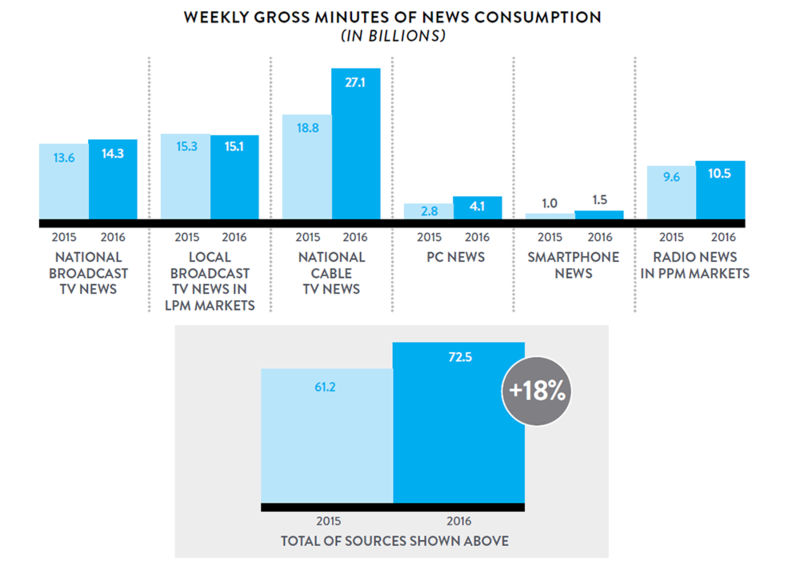 National broadcast TV news consumption was up from 13.6 billion minutes per week in 2015 to 14.3 billion minutes per week in 2016, while local broadcast TV news consumption dipped slightly from 15.3 billion minutes in 2015 to 15.1 billion in 2016. TV news was by far the biggest source of US news consumed last year, followed by radio news, news consumed on PC and then smartphone news, according to the study. “News headlines were non-stop throughout 2016. The unrelenting flood of stories included not just the [US] presidential election but also Syria, refugees, Brexit, Zika, terror attacks, celebrity deaths, and tense relations between police and communities,” said Nielsen’s SVP of audience insights, Glenn Enoch.